I've long loved Tim Gunn. You may recall that he is on my Dream Dinner Guest List (which, by the way, has expanded, but still includes those original guests). This year, however, I met him. In September, when I landed in New York, I turned on my phone and the first tweet I saw was from Tim Gunn, and it made me smile. The thought did cross my mind that we were in the same city at the same time, and my heart jumped a little. Hailey saw it, too, and I think I left her a voxer message at the same time she sent a text: we should go! Yes! We'd go! Together! I invited Ariel, and Hailey invited Jenny, and we made a date for that evening. Ariel met me in Times Square and we took the subway to the Upper West Side to walk to Barnes and Noble. It was a beautiful fall evening, and we got there early so as to get a good seat. After purchasing our books we took the escalator upstairs. As we rode up I turned around to look at the store, and that's when I saw him. Tim Gunn had just walked into the store like a regular person walking into his local bookstore (which, of course, he was). I got a little anxious. Okay, more than a little. Ariel and I stood near the top of the escalator like the two nervous little girls we were in that moment, with a million thoughts racing through our heads in the space of about ten seconds: we're waiting for Tim Gunn! But oh my goodness, what are we doing?! I'm going to just look...yep, he's coming up the escalator. We should leave him alone. Yes. No. This is a once in a lifetime chance. And he's so nice on television, he's certainly nice in real life, right? But we should be nice, too and leave him -- well, too late, there he is. Watching him on television, you know how sincere he is, and I'm here to tell you: HE IS MORE KIND AND GENEROUS THAN YOU THINK HE IS. Stepping off the escalator, he immediately stepped toward me and said, "Hello! Thank you for being here, I'm Tim Gunn." We shook hands, I told him my name is Jenny and then he said . . .
. . . he said, "What a fantastic sweater!" YOUGUYS. TIM GUNN COMPLIMENTED MY SWEATER. I DIED. I could maybe end my story there, but it goes on, and we small-talked, Ariel and Tim Gunn and me. And I asked, "Would it be too much trouble to ask you for a picture?" He happily agreed. We thanked him, he thanked us, and he made his way to prepare for his presentation. I couldn't stop smiling and shaking, and Ariel and I just couldn't believe what had happened. I wish so much that Hailey and Jenny would have been there with us for that! The presentation was wonderful. I could have listened to Tim Gunn and his co-writer Ada Calhoun talk for a few more hours. 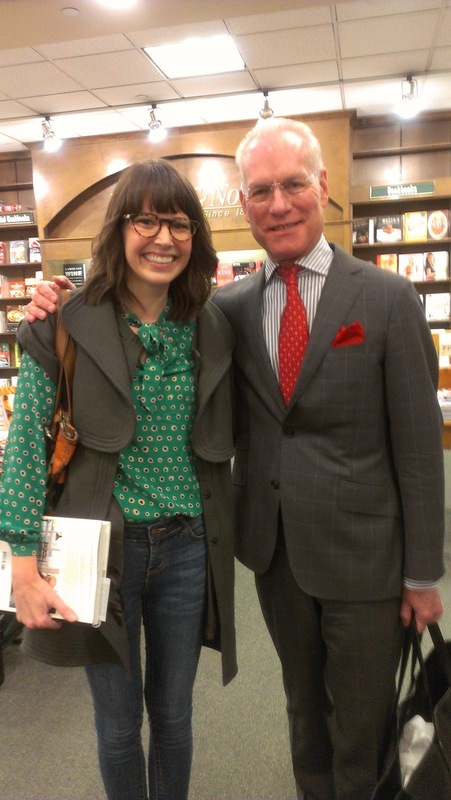 We stayed to get our books signed, and it was announced that Tim Gunn would not be posing for any photographs. So I . . . stood to the side . 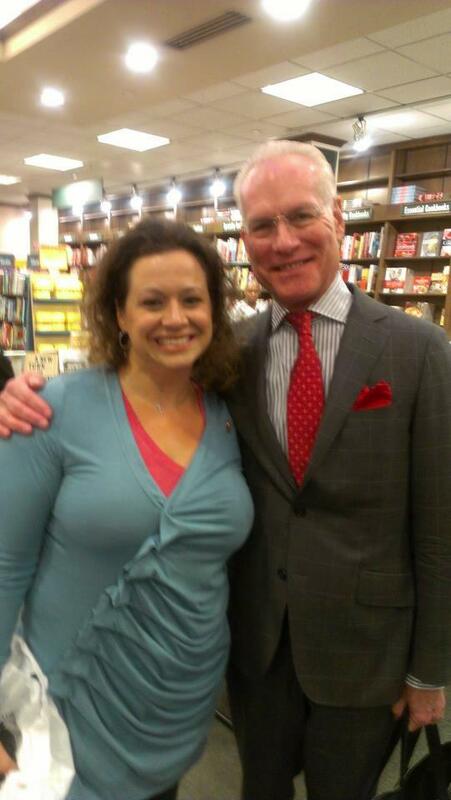 . .
Tim Gunn is genuinely awesome and Tim Gunn's Fashion Bible should be on your shelf. When I read that, I thought, I trust my new friend Tim Gunn. Plus, he likes my sweater. He wouldn't steer me wrong. For the first time in my life, I purchased an acorn squash, and on Thanksgiving I did what Tim Gunn told me to do, and guess what. It was by far the MOST DELICIOUS part of our Thanksgiving dinner, I'm not joking. And so to Tim Gunn, I offer my sincere thanks for making a difference in my life, not only on the day we met and you complimented my sweater, as well as every time I remember that evening, but also any time my family enjoys that yummy dish. Small steps for you, great memories for me. Thank you, Sir, for being nice. My heart is beating faster for you! I've said for years that I wish TG was my uncle. Wouldn't that be the best? Love this post. So glad to hear that he is just as friendly and gracious in real life. So happy that you had such a fun experience with him! You are so lucky! I just adore that man. My son and his girlfriend and I get together to watch every episode of Project Runway together. I can totally hear his voice (with hands out) saying, "What a fantastic sweater!"